The drive from Anchorage to Kenai/Soldotna is beautiful, breathtaking, and majestic. We've driven this route hundreds of times over the past 30 years, and we still enjoy it every time. From the mountain views that remind us of the alps (minus the buildings, trams & tunnels) to the wildlife, rivers, and oceanfront beauty along the way we hope you'll find it just as enjoyable as us. Here are some pointers to help guide you along the way! Enroute from Anchorage, take the Seward highway south from town along the scenic Turnagain Arm, a tidal fjord-like extension of the upper Cook Inlet. Watch for Dall Sheep on the cliffs, especially near Windy Point. Watch for moose in the hollows and bear on the hillsides along the entire drive. About 30 minutes south of Anchorage turn left if you have time for a quick sidetrip up Girdwood Valley. Drive to the end of the road where the beautiful Alyeska Ski Resort Hotel is located, turn left near the big wooden resort sign to continue another 5 minutes up the paved road to the actual resort hotel. Along the way you’ll get a glimpse of Alaska's one and only major Alpine ski resort and the beautiful temperate rain forest of Girdwood. Near the day lodge there is an old restaurant called the Alyeska Bake Shop that offers great mountain food and homemade sourdough rolls, bread and giant cinnamon rolls that are worth the visit (when you turn left at the intersection that leads to the hotel, take the first right at the Jade Shop and watch for the bake shop signs). The total drive off the highway is less than 10 miles. The forest floor, under the big hemlock trees, is covered in ripe blueberries from late July through early October. Return to the Seward Highway. About 15 minutes further south along the Turnagain Arm on the Seward hwy you’ll find the Portage Valley road also on the left. Take this scenic drive (also less than 10 miles) up to Portage lake, stopping to photo several Alpine Glaciers including Explorer, Middle and Byrn, all alpine glaciers that hang off the mountainside. At Portage Lake there is an excellent interpretive visitor center, the 500+ foot deep lake (hopefully with icebergs on the shore) and a boat cruise that goes across the lake on tours to the face of the glacier. There is also a lodge/gift shop/restaurant near the visitor center, and the road continues around the lake to the Whittier Tunnel (Alaska’s only tunnel) leading to Prince William Sound and the port of Whittier. Once you get back on the Seward Hwy south you’ll climb Turnagain Pass, the highest point on the route to us. 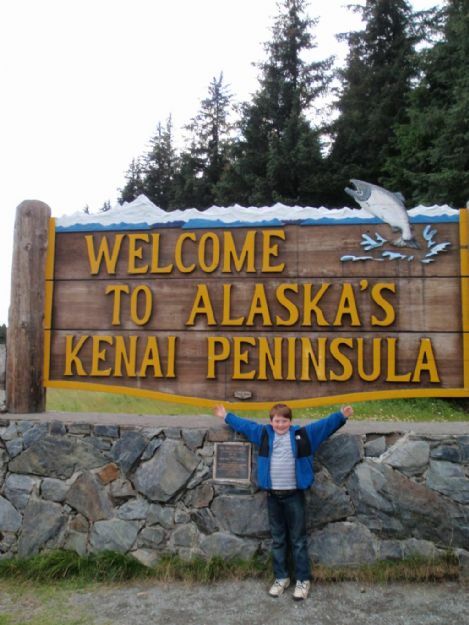 At the start of the climb, on the right is a carved wooden "Welcome to the Kenai Peninsula" sign which makes a great photo start to your trip on the Kenai. There's a nice pullout parking area on the right just before the sign. You'll know you're almost there when you leave the ocean behind and come around the first bend to start climbing the pass. The alpine views are great throughout Turnagain Pass. In the winter, one side of the highway is dedicated for mountain snowmachining and the other is for backcountry and Nordic skiing. Scan the hillsides with binoculars for moose & bear, from one of several pullouts/rest areas in the pass. Following the Seward Hwy you’ll drive past the Johnson Pass Trail Head (a summer hiking/winter snowmobiling trail), past Granite Creek Campground (nice quite place to camp), and over the Canyon Creek bridge (pullout/rest area with outhouses on the right & left). The Hope cutoff road is just over the bridge on the right, leading to the old, nearly deserted Gold Mining village of Hope on the far side of Turnagain Arm opposite Girdwood. The Hope road is about 20 miles or less. 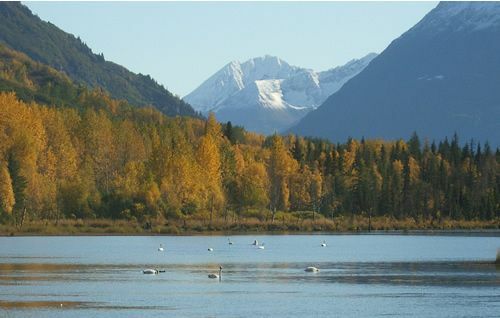 As you continue south on the Seward Hwy you'll come to the Summit Lake area, with a lodge & gift shop on the left at the lake, and a campground on the back side of the lake. Espresso, ice cream, flushing bathrooms. Nice restaurant too. You’ll take the exit off the Seward Hwy near Tern Lake to the Sterling Hwy shortly after the lodge (15 minutes) and follow the Sterling Hwy through Cooper Landing, passing beautiful Kenai Lake at Sunrise corner (the headwaters of the 80 mile Kenai River, gas/food/lodging). As you enter Cooper Landing, at first site of the lake, there is a turn to the left to Quartz Creek Campground. It’s worth a quick rest stop to see the lake and mountains and take a break. Following the Sterling Hwy through Cooper Landing, an old gold mining settlement and current Red Salmon fishing mecca famous for its "combat fishing", you’ll pass over the Kenai River Bridge at the source of the river and wind through Cooper Landing (drive slow, 35~40 and watch for moose & bear). As you pass over any river bridges look up and down river for brown bear feeding on salmon. If you see some you can turn around, go back and get pictures, especially as you pass by the Russian River Ferry area and the big bend above the river. Throughout Cooper Landing you'll find lodges (the biggest is the Princess Lodge high above the Kenai on a bluff), B&Bs, rafting companies, fishing charters, stores, coffee shops, restaurants, a quaint historical museum and a post office. Continuing on now you’ll be here in Soldotna on the lower Kenai River in less than an hour. You’ll come out of the mountains and continue along the flat lands, watch for moose along the highway. You'll parallel the "Skilak Wildlife Management Loop" along the highway on your left from Jim's Landing on the Kenai River to the south entrance nearing Sterling. If you want to look for wildlife and checkout the access areas to Skilak Lake and Hidden Lake you can take the rough gravel road and enjoy the scenic route. You may see Black Bear, Brown Bear, Moose, Porcupine, Grouse, Coyote, Snowshoe Hair, and even an occassional Owl or Fox. Back on the highway route, you’ll drive through the little community called Sterling just 10 miles outside of Soldotna. Stay awake, traffic picks up a bit! 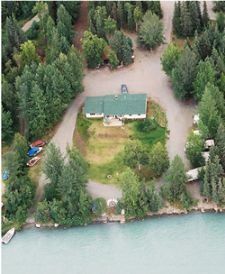 This area is a mix of residential, lodges, and fish camps along what's commonly called the middle river of the Kenai. Entering Soldotna, slow down, watch for police, the speed limit is 35 throughout town. You’ll need to look for a gas station to buy your fishing license at, Tesoro 2 Go is the quickest. Kids just need a harvest card, no fee but you have to ask for it. In Soldotna you can buy groceries at Fred Meyer (open till Midnight) or Safeway (24 hours). We also have the normal variety of McDonald's, Taco Bell, Arby's, Dairy Queen, pizza joints, Mexican restaurants, and a couple of fine dining places. For local beer go to Kenai River Brewing behind Froso's Greek/Italian restaurant on the Kenai Spur Hwy, after the drive you can finally have a cold one! www.kenairiverbrewing.com. What are the purplish flowers along the highway in big patches? Either Fireweed or Lupine. Lupine are in full bloom in June and grow closer to the ground and are darker purple. Fireweed are much taller and bloom from late June through mid August, when they turn to dark red as their seed pods form and the flowers fall. Fireweed blossoms make excellent jelly too! The direct drive from Anchorage to our door takes about 3 hours. If you take the sidetrips of Girdwood & Portage, and stop for photos in the mountains and Cooper Landing you can expect it to take 5-6 hours. What do we do if we hit a moose or bear on the highway? If you can't avoid the collision, lay back or down as you impact, especially in a small car, in the event that moose comes across the hood and into the cab. Cover your head and face. Call 911 to report the incident, even if it appears minor, so the wildlife troopers can come and take care of the animal. What are the strange waves along Turnagain Arm? Turnagain Arm has the 2nd largest tide change in the western hemisphere, after Bay of Funde Novia Scotia. The tide can swing 40 feet. This radical change in water levels causes strong currents, and when these currents are acommpanied by the frequently strong winds of this area they form Bore Tides, which appear as an endless wave that can travel for miles, ranging from a foot to several feet in height. Sometimes windsurfers or kit surfers can be seen enjoying these waves, albeit with dry suits, training and/or lot's of guts. During June & July, at the peak of our season, and on all major holiday weekends including Memorial Day, Independence Day, and Labor Day (Friday south, Sunday North) you can expect heavy traffic at times, especially in the evenings heading south or north. Mornings are lightest traffic always. The Seward Highway, particularly the first hour south of Anchorage along Turnagain Arm is narrow, winding, and unfortunately well known for fatality accidents from head-on collisions. USE EXTREME CAUTION driving this section, watching for other cars with drivers that may fall asleep or get distracted from the extreme natural beauty of the area or wildlife along the hillsides. Be a defensive driver and you'll be fine. The entire highway system on the Kenai Peninsula is just two lanes, head to head, so you have to always watch for head on collision type accidents with tired fishermen at the wheel late in the evening especially. Also watch for moose & moose calves crossing the highway because an accident with a moose can also take your life due to their sheer size. We want you to arrive safe and get home safe, so please excercise caution as you drive this incredibly scenic route between Anchorage and the Kenai Peninsula. The Alaska State Troopers vigilantly patrol this entire highway system and are unforgiving of reckless or drunken driving. Please don't drink & drive. Where can we call for traffic or road condition information? Call 511 or visit http://511.alaska.gov for up to date information on road conditions, road construction, and weather year-round.